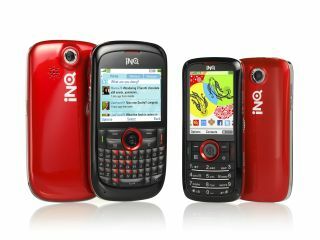 The INQ Chat 3G - the QWERTY bigger brother to the Mini 3G - has gone on sale through 3. The device will also cost less than expected, coming in at only £99.99, rather than the anticipated £120 when it was shown off earlier this year. The Chat 3G offers an inbuilt Twitter client from the home screen, leading to it being dubbed the 'Twitter phone' in a similar way that the INQ1 was called the 'Facebook phone'. Users of the Chat 3G can also get the phone for free at only £15 per month with unlimited texts and Skype to Skype calling and 75 included minutes of talktime. We were pretty impressed with the device when we played with it earlier this year, and we'll be bringing you a full, in-depth review in the near future.